Chinese smartphone major ZTE has announced another smartphone which is code named as ZTE Grand S Flex. This smartphone sports a 5 Inch IPS LCD Capacitive touch screen with multi touch. ZTE Grand S Flex comes with a HD display which packs in a resolution of 1280 x 720 Pixels, ~294 ppi pixels density, 16 M Colours. Dimensionally this smartphone from the chinese manufacturer measures 143 x 70 x 8.9 mm (5.63 x 2.73 x 0.35 in), while it weighs mere 130 gms (4.59 oz) & to avoid the confusion in selection ZTE Grand S Flex comes in only one flavour viz; Black/Silver. Under the hood this smartphone is loaded with a Dual Core 1.2 GHz Processor, Qualcomm MSM8930 Snapdragon Chipset, Adreno 305 GPU, 1 GB RAM. Technically this smartphone will give reasonable experience in terms of multi tasking and gaming. The internal memory stocked in ZTE Grand S Flex is of 16 GB & this smartphone lacks a slot for microSD card. 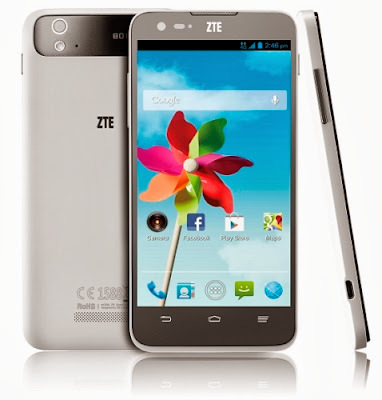 ZTE Grand S Flex will come out of the box with Android OS v4.1 (Jelly Bean). The data connectivity aspect of this smartphone features Wifi, Wifi HotSpot, Bluetooth v4.0 with A2DP, microUSB v2.0. For positioning ZTE has packed in GPS with support for A GPS. The Primary camera on the rear panel of this smartphone is of 8 MP with LED Flash light, auto focus, geo tagging. This Primary camera is capable of clicking images of resolution 3264 x 2448 Pixels & record HD videos of 1080 P @ 30 fps. The Secondary camera on the front panel is of 1 MP for video chatting. ZTE Grand S Flex comes with a Li-ion Battery with a juice of 2300 mAh.